Mary thought he looked a little like Tom Selleck, only with blonde hair. She pressed her face a little closer to the knothole in the fence to spy on him. She thought he had a great chest – all hairy and hard. Mary thought it would be nice to run her fingers through all of that hair. Laura stopped typing. “Mary, you think too much,” she mumbled taking a moment to proofread her work. “This is the worse romance story EVER,” she snarled while pounding on the delete key. She placed her head in her hands and cried. This is a themed writing meme hosted by The Head’s Office. The goal is to write something that does not exceed 100 words. The prompt this week is in bold. Labor Day weekend. I have mixed feelings about Labor Day – on the one hand, COOL. A long weekend. On the other hand, NOT COOL that so many people don’t have a job to take a labor day FROM. I know eventually we’ll find jobs, it’s just discouraging that it’s taking so long. I don’t want to brag or anything, but it has never taken me this long to find a job. I almost had a job back in March: I had three interviews and it was between me and one other woman. But because I’m an honest person and don’t believe in withholding the truth in order to advance my personal agenda, I told them that I would need a week off in July in order to take a family vacation that we had booked since January. I don’t know for sure, but I suspect that is the reason I didn’t get the job. At any rate, it’ll happen. I just need to be patient and vigilant. I am focusing on getting my foot in the door with a certain industry with the intention of moving up the ranks over time. I like this industry, I think I would be good in this industry, but it’s hard to get into this industry. If nothing happens by the time November rolls around, I’ll likely look into banking again. (I want to keep my Saturdays free so I can attend Jazz’s band competitions which is nearly every Saturday in October). I have a lot of experience in banking and it seems they are always looking for people so … we’ll see. I like banking and wouldn’t mind working in that industry again, but I’m not crazy about having to rotate Saturdays even if it is only half a day. What have we done all weekend? Saturday – chores. I know – YAWN. Kevin did take the ramp off our front porch, though. We had a ramp because after Kevin’s motorcycle accident he had to use a wheelchair to allow his crushed pelvis time to heal. And we needed some way of getting him in and out of the house. My father-in-law and brother-in-law came over and built the ramp a few days before he was scheduled to be discharged from the hospital (he was in intensive care for two weeks, at a rehab center for three weeks). It was a highly emotional time for our family. So it was really satisfying to remove the ramp from our porch. Even though Kevin has been up and walking for over a year now, still, it felt good to remove the last trace of his accident from our home. (By the way, the woman who hit him? [It was a head-on collision and the woman TOOK OFF after the accident] Still hasn’t been punished. I KNOW! Our system is maddening). Saturday night, Kevin talked me into going to his band gig and taking pictures. I don’t normally go to his gigs because it’s awkward for me to sit in the audience, solo, and get hit on. (Not bragging, just saying). Kevin’s parents usually show up, and that’s fine, it gives me someone to sit with and talk to, but still … THE IN-LAWS. It’s still a little awkward. They’re called “Midnite Thunder” and they play 80’s music. (You can see more pictures on Kevin’s Flickr). They played a lot of new songs Saturday night and I thought they sounded pretty good. (Course, I’m biased). If you’re in the Springfield (MO) area and you like that kind of music, you can keep track of when they play next on their website. Sunday, we were all pretty much dead. We’re old – late nights pretty much KILL us. 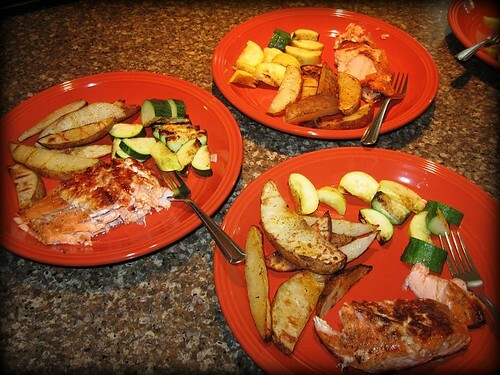 But Sunday night, Kevin bought some salmon, zucchini and I boiled some potatoes for him to make steak fries with. He grilled everything. We took advantage of the wonderfully cool weather and ate out on our pergola. And that salmon was flaky and delicious! I swear Kevin could be a chef, he’s THAT good. (We also had a little spider “episode” – I thought the boys were going to have a heart attack … over a little spider. I mean, yeah, creepy, but come on boys – grow a pair. Sheesh). Today? We’ve been taking it easy. Catching up on laundry, sleep, goofing off. Kevin and I are getting ready to make a trip to Lowe’s to buy an outside fireplace to use on our pergola this fall. I KNOW. Doesn’t that sound fun? To snuggle next to an outside fire with a cup of cocoa cradled in our palms, listening to soft music and looking at the stars? Tomorrow, it’s back-to-school for Jazz and back-to-the-office for me, Kevin and Dude. We’re making Dude dress up in slacks and a polo shirt to come to the office in – he has been looking pretty scruffy lately and it’s good practice for whenever he gets a job. He’s also going to get a trim this week, too, but he doesn’t know that part yet. (And he’s going solo. He’s too old for mommy to hold his hand on these things anymore). I got a surprise call late Friday afternoon – the interview I went on last week, the one I thought I had COMPLETELY blown? Well apparently, I didn’t. Because I’m supposed to call them tomorrow and schedule a second interview. I’ll be honest, I’m not sure this is a job really want, BUT, it’ll get my foot in the door and who knows what sorts of opportunities will come up after that. Hey. When you’re starting out, you have to take what you can get. I am seriously going to try this technique. It probably won’t turn out nearly as good as this guy’s set, but it’ll be fun trying.